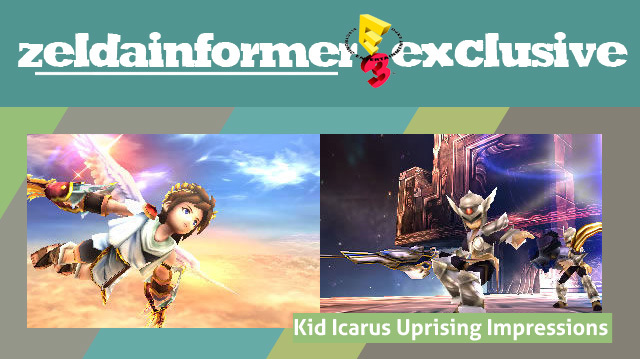 Kid Icarus is back… sort of. While the new installment on 3DS definitely features some familiar faces, gameplay ideas, and storyline, the new ideas brought to the table by Project Sora have almost completely overhauled the look and feel of the game. Where Kid Icarus was once a side-scrolling platform shooter, now it’s a combination of on-rails shooting and beat-em-up action. Overall, I think this is a good thing – Nintendo has plenty of platforming franchises and almost zero action ones – but did Sakurai’s team pull off a quality synthesis? And does the choice to heavily incorporate touch control hurt or help the game? These impressions are going to focus solely on the single-player aspect of the game, since being only one man I didn’t have time to get to the multiplayer station. Sad times. Before I started the demo, I had the option to select from one of several weapons. There were the simple blade and bow, basic but nimble weapons, a large cannon that’s powerful but slow and unwieldy, as well as several other weapons such as a magical orb and a set of sharp claws. Whatever you choose is your only option throughout the entire demo, so I just decided to stick with the basics from Pit’s classic arsenal: Palutena’s bow and blades. Most levels start off with a fly-in section, where you soar through waves of enemies to get to your destination. The demo I played, which involved a character the Dark Lord Gaol, had me flying through a dark valley to reach the Dark Lord’s palace. The combination of Circle Pad for movement, L-trigger for shooting, and the touch screen for aiming works really well during these on-rails flight sessions, and is surprisingly easy and precise. 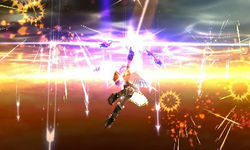 Defeating enemies earns you hearts, which work as a kind of scoring system. You can earn hearts faster if you use a special attack, triggered by tapping an icon on the touch screen as you fly. On the ground, battles are conducted in much the same way, only instead of the Circle Pad moving you around the screen as the level pushes you forward, you’re much freer in terms of exploration. Moving the stylus still lets you aim your weapon for long-range attacks, but it also pans the camera so you can change your viewpoint. Stylus + Circle Pad controls are a little more jarring on foot than in the air, but they work well, aside from some responsiveness issues when trying to change up your viewpoint. Dungeons aren’t too complicated, and “puzzles” usually consist of typical level-crawling stuff like finding the one or two switches you need to open the door or defeating all of the enemies. 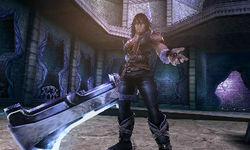 At certain points, you’ll meet up with “partner” characters – in this case, I found a man named Magnus who had a score to settle with this “Dark Lord.” Partners do exactly what you’d think they’d do – they come with you as you explore the dungeons and help you deal with enemies. This guy went around wailing on demons with his giant sword. As you explore, look for holy water that can refill your health, and occasionally you’ll even run into an entire font of life juice to restore you to full life. This demo ended with an intense boss battle against the Dark Lord himself. I won’t spoil what happens during and after this scene, but suffice to say that they’ve injected a full storyline to go along with the jump to the action genre. It’s a little weird to see human characters in the Kid Icarus world, but then it couldn’t consist just of heaven and hell. My wife and I love Kid Icarus, so this’ll be coming to our collection no matter what, but it’s nice to know that Nintendo’s first major foray into the action genre on 3DS actually isn’t half bad. Not sure if all Kid Icarus fans will feel the same way, since it’s definitely very different from the classics, even in aesthetic, and it’s far from the best 3DS demo on the show floor, but it’s good enough that I’m still deeply intrigued, as I am with anything Sakurai touches these days, and intend to pick up a copy on or soon after its launch.